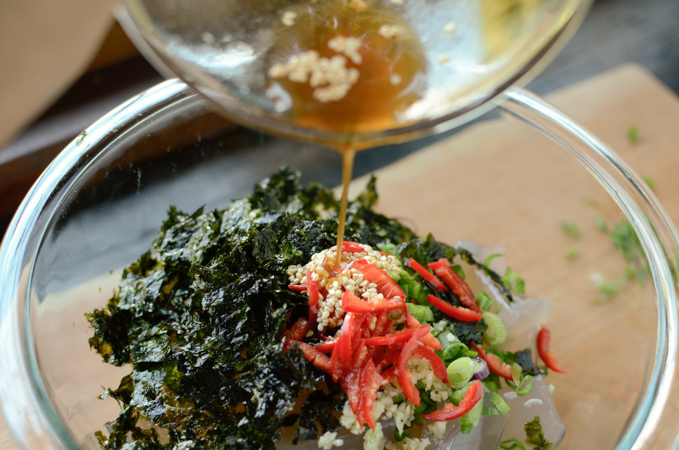 Have you heard of Korean “Mook (묵)”? 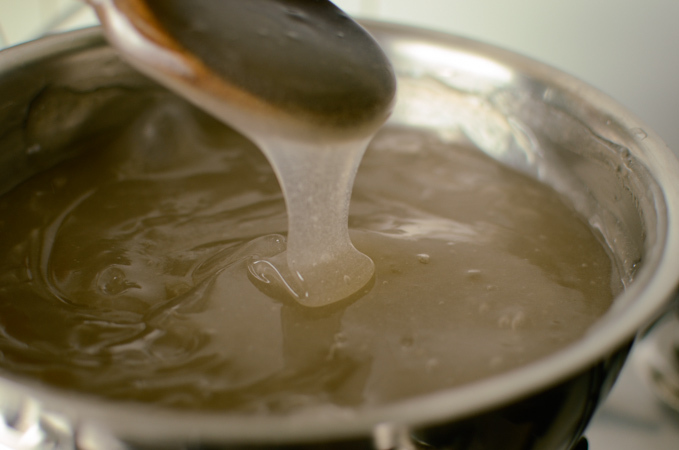 Mook is basically jelly made with various type of starch. There are acorn mook (dotori-mook, 도토리묵), mung bean mook (chungpo-mook, 청포묵), and this olbangge mook (올방개묵) that I am using. 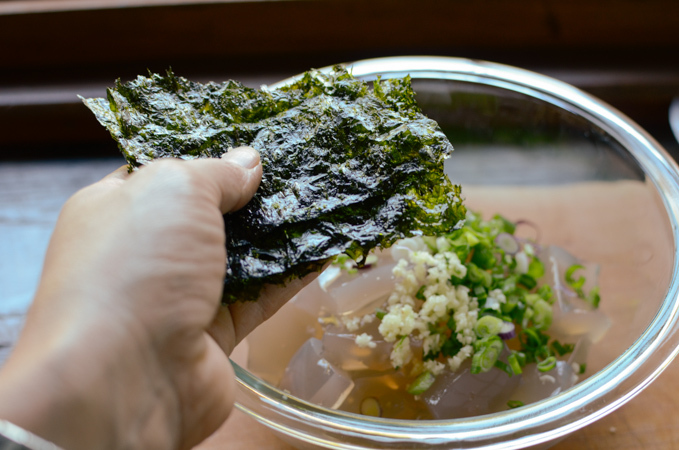 If you’ve dine in Korean restaurant many times you provably have seen similar jelly side dish. A friend of mine, whom I got to know via online blogging in Korea, sent me some of her olbangge mook powder along with other Korean vegetable seeds that her mother sent to her from Korea. How sweet of her to show a such kindness! 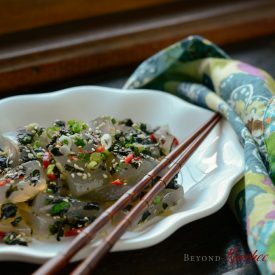 So I made this wonderful Korean jelly salad and enjoyed every bit of it. Olbangge is a plant that grows around the pond near the most rice fields in Korea. If you can’t find this gelatin powder, you can substitute green bean (mung bean) starch which is available in most Korean grocery store. They are quite similar in taste and texture except that green bean jelly (or mung bean jelly) will be more milky white color. Here are the jelly/gelatin powders. The one on the left is green bean starch, and the right is the olbangge starch. Mix 1 cup of starch powder with 6 cups of water in a large sauce pot. Add a couple of pinches salt. Bring it to boil over medium heat, stirring constantly. When it start to boil, cook 5-7 more minutes. It will become thick paste like gelatin. When done, remove from heat and pour the gelatin into a container. Let it cool completely. 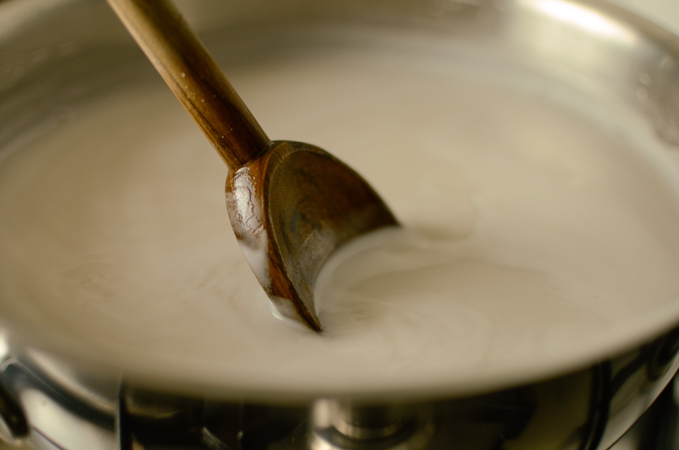 If not using on the same day, chill it in the refrigerator and the color will become slightly milky and more opaque. 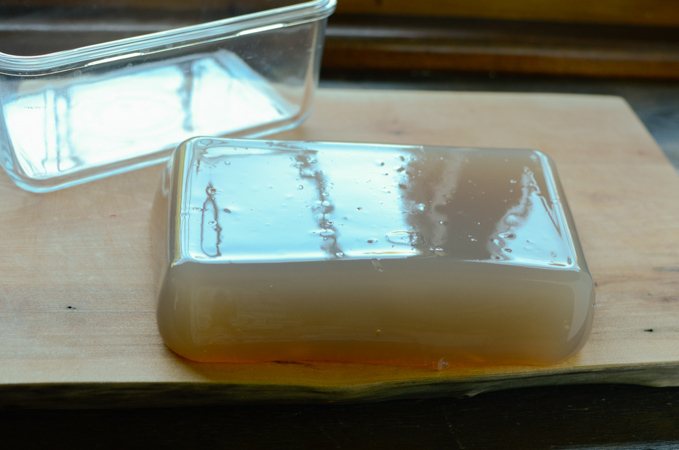 When gelatin is set, turn out to a cutting board. It should come out very easily. Now, why don’t you have some fun with the jiggling matter you created? I did. 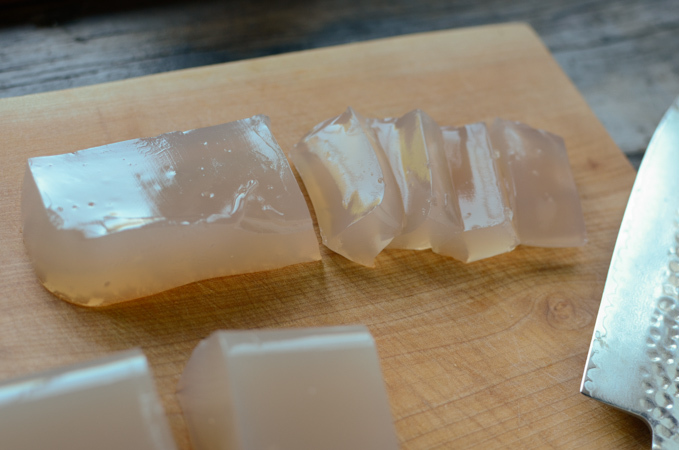 Cut the gelatin into bite size pieces. I only used 1/3 of the entire gelatin block to make this salad and save the rest in the fridge for the next use. So if you want to use entire block of gelatin, triple the amount of the sauce below. 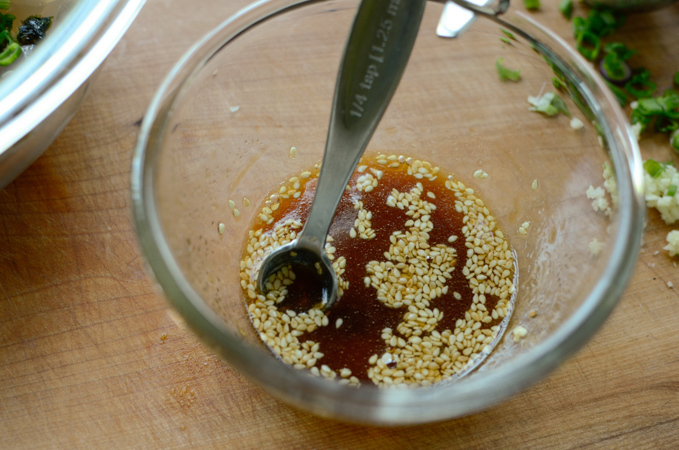 In a small bowl, mix together soy sauce, vinegar, sugar, salt, sesame oil, and toasted sesame seeds. 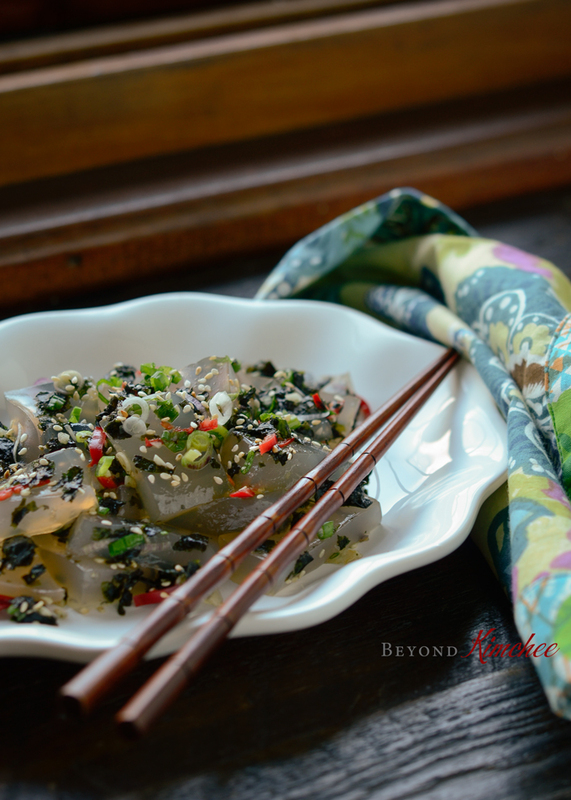 You will like the gentle chewiness of jelly with soy sauce salad dressing. The addition of the seaweed pairs the jelly so nicely, too. The calorie is so low that I could finish off the entire plate by myself without much guilt, and it is quite filling. Now that’s a kind of food I need these days. Hope you enjoy this salad, guys! Happy spring! 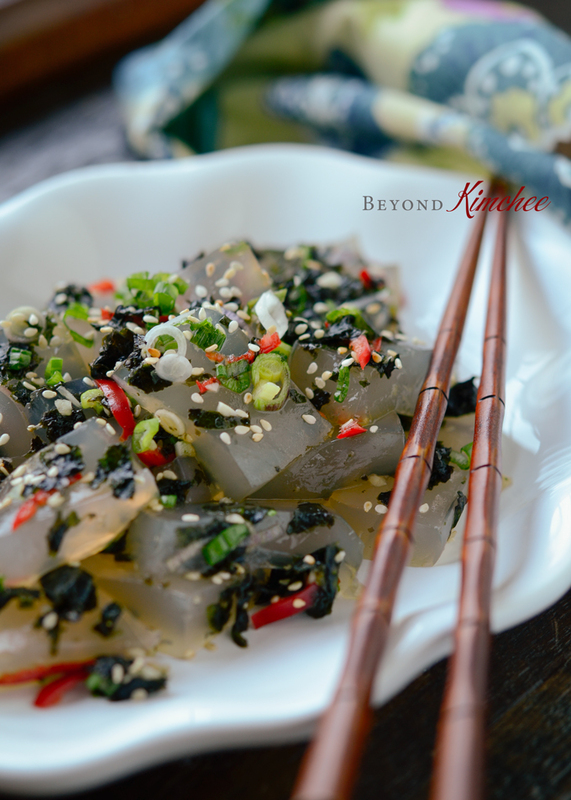 Light and refreshing Korean jelly salad is easy to make from scratch. Mix 1 cup of green bean starch (or olbangge starch) with 6 cups water in a large sauce pan over medium heat. Bring to boil stirring constantly. When it starts to boil cook for 5-7 more minutes until the mixture becomes opaque and thick paste. Remove from heat and pour into a container. Let it cool in the room temperature completely. If not using on the same day, store in the refrigerator for later use. When the gelatin is set, turn out to a cutting board and slice 1/3 off from the block We are using only 1/3 of the entire amount. Slice the gelatin into bite size pieces and place in a mixing bowl. 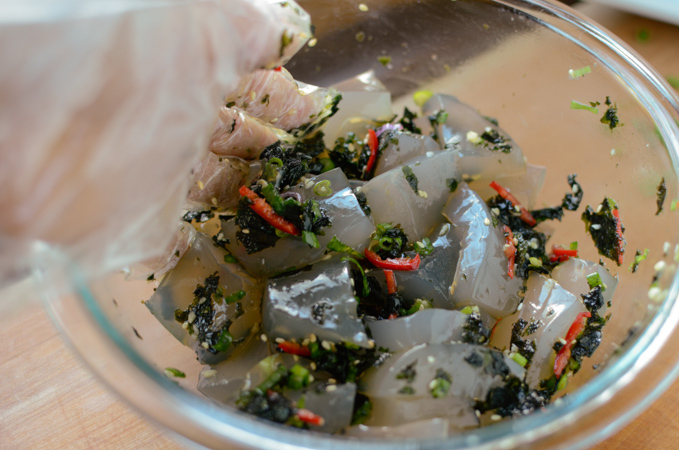 Add the crushed seaweed, green onion, garlic, and, chilies. 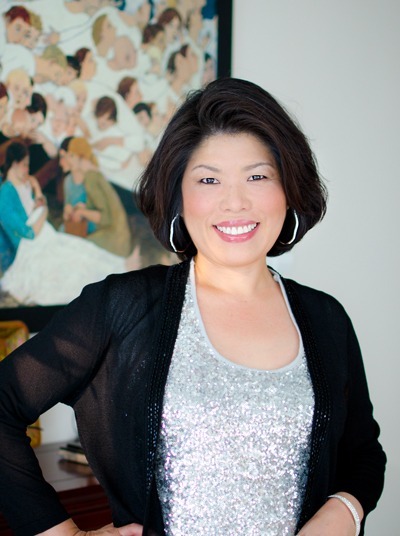 In a small bowl mix together soy sauce, sugar, vinegar, salt, sesame oil, and sesame seeds. Drizzle the sauce over the gelatin mixture. Toss well, and serve at room temperature or chilled. 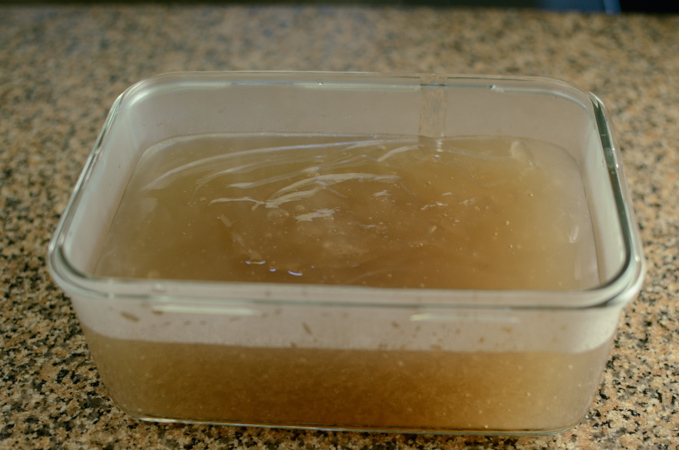 The salad dressing amount is good for 1/3 of the gelatin block. If you want to use entire block, triple the dressing amount. my sister loves these!!!! I'll definitely need to show her this! They look tasty too! This is totally new to me! Love the shine on the jelly -- so pretty. Kinda reminds me of aspic. Really interesting salad -- thanks! Yum! Looks like a great side dish, perfect for summer too. Looks delicious as always. I miss living near a Korean store. There is one Chinese store here in Leeds, UK that sells some Korean products, but the things that you can get there are random. I can get 고추장, but not 고추가루. It makes for planning to cook something interesting. I would be intimidated to try this because ive never seen something like it before but i can bet its delicious! It is indeed intimidating to try jelly into savory salad like this one. Many people who tried loved it. 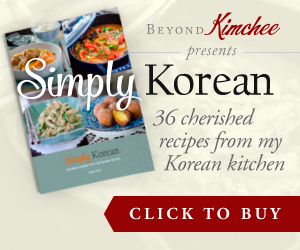 It is light and tasty to as is or as a side dish to Korean meal. I discovered your delicious looking recipe yesterday morning. My eldest daughter and I headed straight to our nearest Asian market. 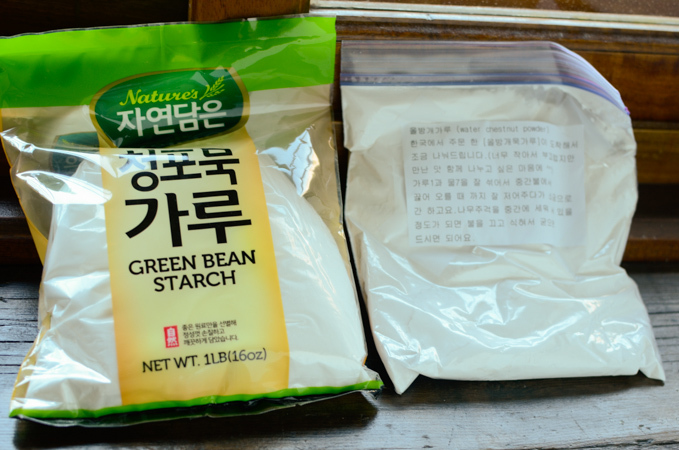 We finally found the green bean starch, so I'm heading to the kitchen now to make the jelly. 😀 Thanks for your wonderful recipes.